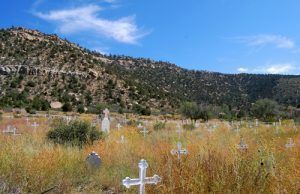 With inhabitants dating back some 10,000 years, New Mexico’s story is rich with history, from the Ancient Puebloan Indians, to Spanish explorers, pioneers traveling along the Santa Fe Trail, and prospectors in the 19th century. These many folks left their “footprints,” not only along the many old trails in the “Land of Enchantment,” but also on the many ruins and ghost towns that remain. 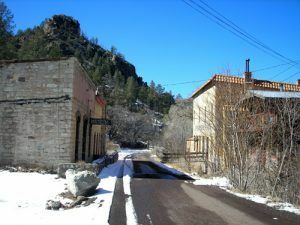 From abandoned pueblos to old mining camps, to deserted railroad and ranching towns, New Mexico is left with hundreds of ghost towns and historic sites to explore. 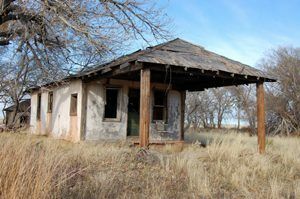 An old business building on the New Mexico side of Glenrio. Photo by Kathy Weiser-Alexander. 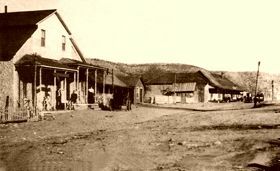 Old Company House, Madrid, New Mexico. 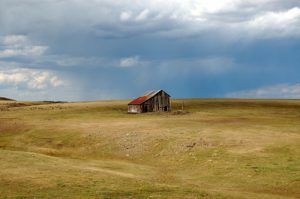 Photo by Kathy Weiser-Alexander, 2006. Click for prints & products.